Peugeot’s 3008 Hybrid4 is the first diesel-electric hybrid car to go on sale in the UK - orders are already under way - but it happens to be the second diesel hybrid I’ve driven, after my recent spin in a prototype Volvo V60 hybrid. The two cars have a fair bit in common. Not only are they both diesel-electric, they are also both “through-the-road” hybrids, with an absence of mechanical connection between an engine-driven axle up front and an electrically propelled axle at the rear. 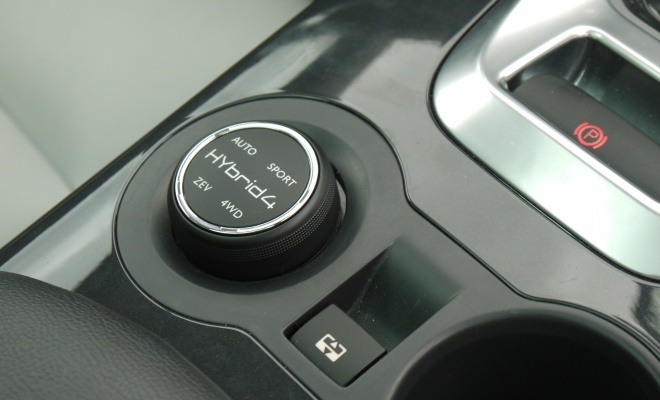 Similarly, both cars allow the driver to choose among various driving modes including four-wheel drive. Beyond that, the similarities begin to fade. The Volvo is a plug-in car with a substantial 12kWh battery and 70bhp electric motor, whereas the Peugeot is entirely liquid fuelled and manages with a tenth of the battery capacity and half as much motor. You can feel the difference when you floor the throttle from a standstill. Both cars employ their independently driven back axle to try to smooth away the pause between gearbox ratios at the front. In the Volvo, the result is uncannily seamless. In the Peugeot? Well, the electric motor can’t quite disguise the ponderous changes from the Pug’s automated manual. The Peugeot’s box offers six ratios and can be slotted either into an entirely automatic mode or into paddle-controlled semi-manual operation. I can’t vouch for the paddles, as my brief stint behind the wheel at the recent EcoVelocity event was done entirely in auto. If demands are light, the changes feel smooth and unobtrusive – it’s only when pedal inputs become urgent that the box gets all befuddled and jerky. Under the bonnet there’s a four-cylinder 2.0-litre HDi turbodiesel engine producing 120kW (163bhp), driving the front wheels through the above mentioned gearbox. Under the boot floor there’s a water-cooled 27kW (37bhp) electric motor driving the rear wheels through a differential. 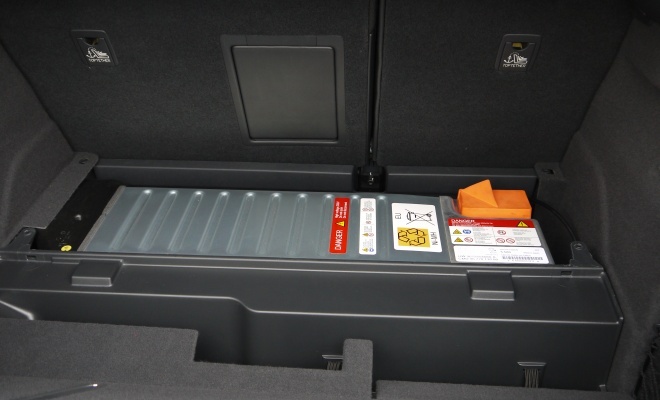 Inside, towards the front of the boot, there’s a 1.2kWh nickel-metal-hydride battery and associated electronics. There are no driveshafts or clutches linking the motor and engine, their combined efforts are synchronised instead by software, developed with help from supplier Bosch, which also provides the motor and other vital components. Nestling against the engine up front is a second motor, a 7kW unit that wears several hats. It acts as a starter for the engine, allowing very seamless starts and stops on the move, but also works as a generator, feeding power to the back axle whenever the battery runs low. A rotary controller nestling by the driver’s elbow provides four options for allotting the available resources. An EV setting prioritises electric propulsion, but only within the modest limits of a fully charged battery – good for two or three miles at best, at geriatric acceleration below 30mph. Go further or faster and the engine will be forced to assist. The 4WD mode, by contrast, immediately fires up the engine to provide sustained shove via both front and back wheels. Sport mode similarly keeps the engine running, and delivers the combined peak of 200bhp to yield an 8.5-second sprint to 62mph, which is not at all bad for such a big and heavy car. At 1808kg, the Hybrid4 weighs about 280kg more than a standard 3008 with the same diesel engine, but is 1.7 seconds quicker to the benchmark. The final operating mode is Auto, which lets the 3008 Hybrid4 decide which way to allocated engine and electricity as the need arises, in search of best efficiency. In this most frugal mode, the big Peugeot records a very impressive 99g/km of CO2 when equipped with 16-inch wheels, 104g/km on 17s, and 108g/km on 18-inch rims. As with high-heeled shoes, fashion requires sacrifice. The corresponding combined cycle consumption figures are 74.3mpg, 70.6mpg and 68.9mpg. While the official scores sound impressive, and the diesel lump may be Euro5 compliant, the Hybrid4 will still spew out much more NOx and particulate pollution than an equivalent petrol-electric hybrid, thus worsening air quality in our already asthma-plagued cities. I can’t find figures for the Hybrid4, but it should improve on the 131mg/km of NOx and 1.9mg/km of particulates coughed out by the standard 163bhp diesel 3008. Peugeot has said that it will use the same Hybrid4 technology on petrol-based models in the future, for those who prefer a cleaner class of hybrid. 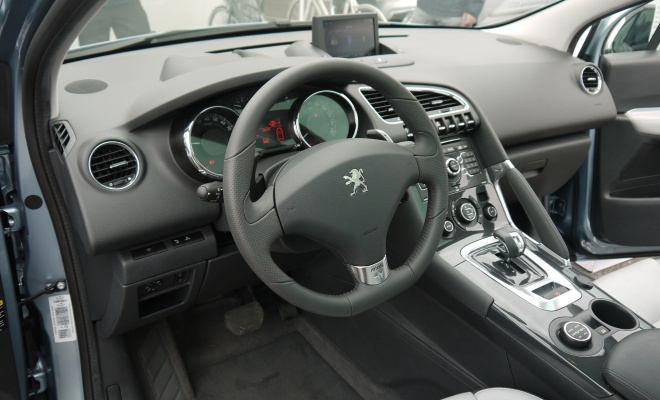 Inside, you sit quite high up in the 3008 as you settle behind the wheel. The ambience is impressively high quality, with a few peculiarities – that rotary mode controller seems like an afterthought way back beside the electronic handbrake flipper. A more welcome quirk is the optional head-up display. Once you’ve acclimatised to reading floating numerals superimposed on the road, you won’t want to go back to the steam-age gauges of the instrument panel. The flat-bottomed wheel is nicely sculpted and has a light, electric action. The broad central console blends into the tunnel and armrest area, cocooning the driver, while there’s a substantial central grab-handle for the front passenger – if that 4WD mode tempts you to go off road. The transmission lever is small and intricately styled and surprisingly offers no resistance between reverse, neutral and drive positions. Presumably some sort of electronic nanny will stop you inadvertently selecting reverse at speed although I confess I wasn’t brave enough to find out. Braking felt natural and linear, as far as I was able to tell at the modest speeds possible on a very confined test drive. Don’t tell the organisers of the show, but I braked sharply from 37mph on what was supposed to be a 30mph track (purely in the interests of science). According to Bosch, the level of regeneration from the rear axle has been kept deliberately low in pursuit of safety, because a rearward brake bias might easily provoke alarming bouts of oversteer when grip is marginal. Hence the front discs are brought to bear as soon as you step on the brake pedal. If you want to maximise efficiency, learn to anticipate, get off the throttle early and avoid the brakes. The handsome interior includes a few surprises – little storage cubbies under the rear footwells, and back seats that flop forward on springs the moment you release their boot-mounted catches. The tailgate is also split into upper and lower sections, lifting up and folding down in the manner of Range Rovers. And talking of upmarket motors, there’s the price. 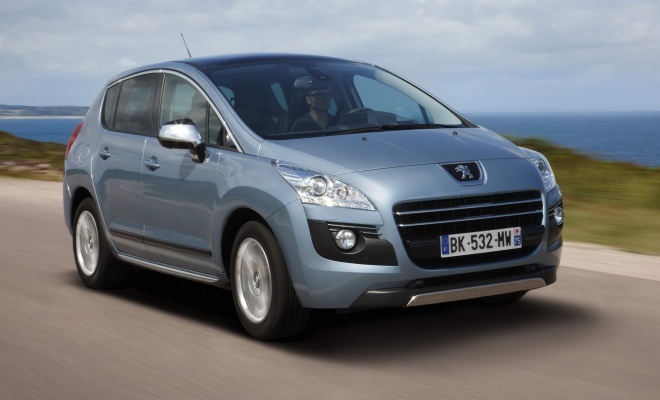 The Peugeot 3008 Hybrid4 will set you back at least £26,995 for the most frugal model on its 16-inch wheels, before the inevitable extras. Metallic paint is £440, a huge glass roof £370 – both of which could be worse. To get the fabulous head-up display you’ll need to opt for the 104g/km model which starts at £28,495 and also brings bigger wheels, a 7-inch flip-up satnav system and the option of leather seats at £1,050. 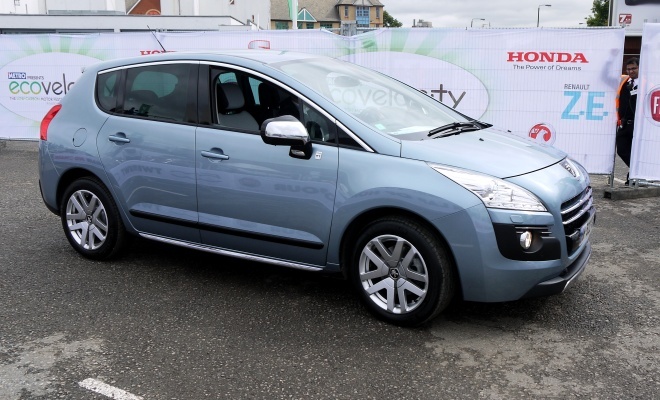 By way of comparison, the poshest conventional 2.0 diesel 3008 starts at £23,795. As ever, it isn’t easy (or cheap) being green.